How much will you pay for an apartment with sea view? A lot, apparently… if you ask the people at Far East that is. 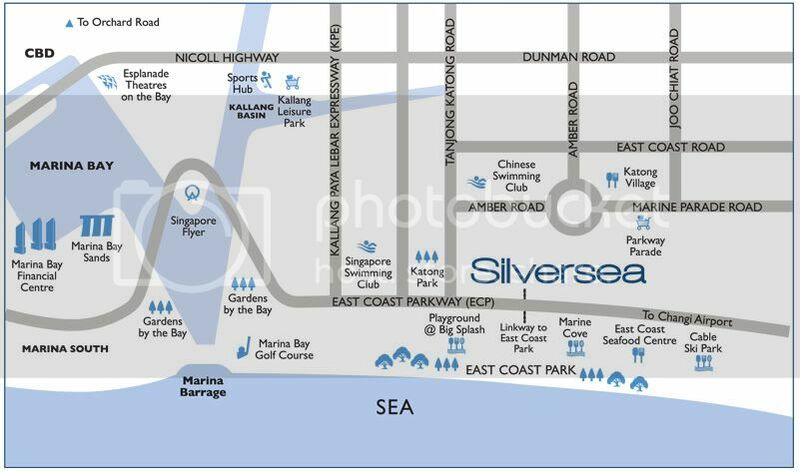 SILVERSEA, developed by Marina Green Ltd (a subsidiary of Far East Organization), is located at the former Amberville site in Marine Parade. The project, being touted as “The last seafront plot in East Coast”, has 383 apartments housed in four 21-storey towers. 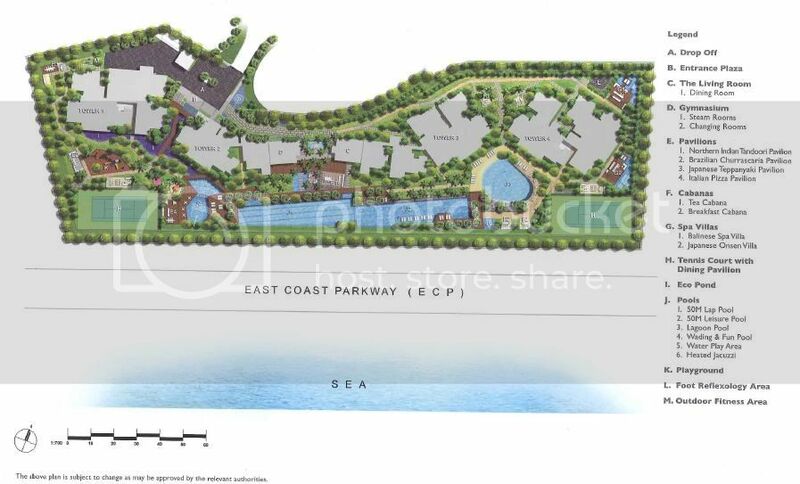 It rests on 285,000 sq ft of land, of which 60% will be used for landscaping. One unique feature of this development is that all the apartment windows are silver tinted – this is probably where the name “SILVERSEA” is partially derived. The expected TOP is end of 2013. SILVERSEA was first launched in 2007, but marketing of the project seemed to have taken off only in the second half of 2009. There was a long period in between where the sales gallery/showflat was closed most of the time, and viewing was strictly by appointment only. We suspect the bad market sentiments due to the global financial meltdown may be a cause for the marketing delay… but do not quote us on this. As of yesterday, 99 of the 170 units launched were sold. In terms of parking, SILVERSEA has 500 carpark lots, of which 29 are designated for visitors. The 2 and 3-Bedroom units are assigned 1 carpark lot each, while each of the 4-bedders and penthouse units will get 2 lots. Only one showflat is on display – a 2,500 sq ft, 4-Bedroom unit. The unit has a “U-Shaped” layout, where the main and back door (accessible via the yard) faces each other. In addition to the common lift, you also get a private lift that opens directly into your unit itself. The master bedroom/living & dining room is located on one side of the unit, while the other 3 bedrooms are on the other side. These are separated by the kitchen and backyard in the middle. • The large living space in the 4-bedroom showflat. Then again, it is 2,500 sq ft after all. • The extensive and unique range of facilities that SILVERSEA provides. 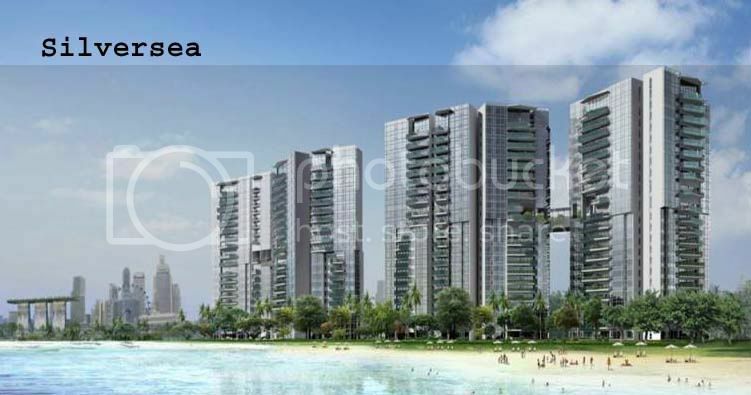 • SILVERSEA is situated very close to East Coast Park and Parkway Parade, so food and amenities are nearby. There are 2 side-gates that allow you access to the underground passage ways across to East Coast Park. • One of the bedrooms in the 4-bedroom showflat is really small. So it gives the impression that the unit is more a “3 + 1” rather than 4-bedder. In the words of the wife, it is really “sad” not to be able to get 4 decent sized bedrooms in a 2,500 sq ft apartment. • This is the first showflat in recent memory where we saw a mix-bag of bathroom fixtures - this we find quite strange. And instead of “Hansgrohe”, you get names like “Antonio Miro” and “Espirit”. I did not even know that “Espirit” makes showerheads and taps! • SILVERSEA is built East-West facing, so as to optimize the sea view. Unfortunately, this means that most of the apartments will have to bear with the direct west sun in the afternoon, and we are unsure how much insulation the silver tinted windows can actually provide. Looking at the site map, units 02 and 03 in Tower 1 are especially affected so be prepared pay more for air-conditioning if you are buying units from these stacks. • To our knowledge, there is only one primary school that is within 1-km of SILVERSEA, i.e. Tanjong Katong Primary School. • The current price for the 3-bedders average around $1,300 - $1,400 psf, while the 4-bedders average around $1,500 – $1,600 psf. So a 1,485 sq ft, 3-bedder unit on the 7th floor will cost you close to $2 million. This puts SILVERSEA, a 99-years leasehold project, on par with some comparative freehold projects (e.g. PURVIS @Holland Hill) in terms of pricing. In summary, we feel that SILVERSEA will be ideal for those who crave for sea facing views and have a couple of millions to spare. And speak of millions, we understand that Tower 3 will be launched next week. The units in this tower are larger, with slightly different layout from Tower 1 and 4, and have better quality furnishings/fixtures. However, the price will also be about 10% higher. 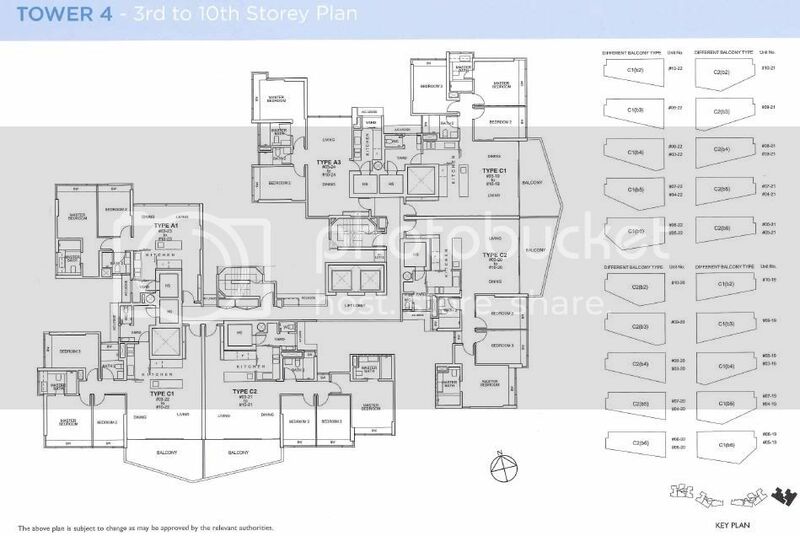 There will be a separate showflat built to showcase the Tower 3 units, but this will not be ready until the end of the month. So do not head down to the sales gallery just yet! No Comment to " SILVERSEA (Review) "